↑ "Western Influences on Satyajit Ray - An Essay by Abhijit Sen (Parabaas - Satyajit Ray Section)". Parabaas. http://www.parabaas.com/satyajit/articles/pAbhijit.html. Retrieved on 2012-11-03. ↑ "martin scorsese inspiration - Entertainment - ShortList Magazine". Shortlist.com. http://www.shortlist.com/entertainment/scorseses-secret-inspiration. ↑ "Satyajit Ray & Mrinal Sen influenced me: French filmmaker". Goa News. 2011-11-24. http://www.goanews.com/news_disp.php؟newsid=1775. ↑ TNN Jan 26، 2012، 12.00AM IST (2012-01-26). "Satyajit Ray inspires Descendants' director - Times Of India". Articles.timesofindia.indiatimes.com. http://articles.timesofindia.indiatimes.com/2012-01-26/news-interviews/30663535_1_satyajit-ray-young-directors-film. 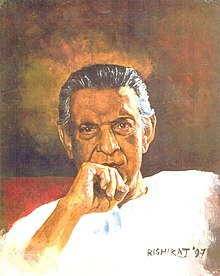 ↑ 5.0 5.1 "Satyajit Ray (Indian film director) : Additional Reading - Britannica Online Encyclopedia". Britannica.com. 2004-08-31. http://www.britannica.com/EBchecked/topic/492404/Satyajit-Ray/6092/Additional-Reading. ↑ Saranya R (2011-12-15). "States / Kerala : Contemporary master inspired by Satyajit Ray". The Hindu. http://www.thehindu.com/news/states/kerala/contemporary-master-inspired-by-satyajit-ray/article2717638.ece. ↑ 7.0 7.1 "Satyajit Ray inspires Italian director duo : Celebrities، News - India Today". Indiatoday.intoday.in. 2009-11-18. http://indiatoday.intoday.in/story/Satyajit+Ray+inspires+Italian+director+duo/1/71366.html. ↑ "If I try to put logic in my life، I will lose my innocence - Interview With Aniruddha Roy Chowdhury". Satyajitray.ucsc.edu. 2011-09-13. http://satyajitray.ucsc.edu/articles/AniruddhaInterview.html.